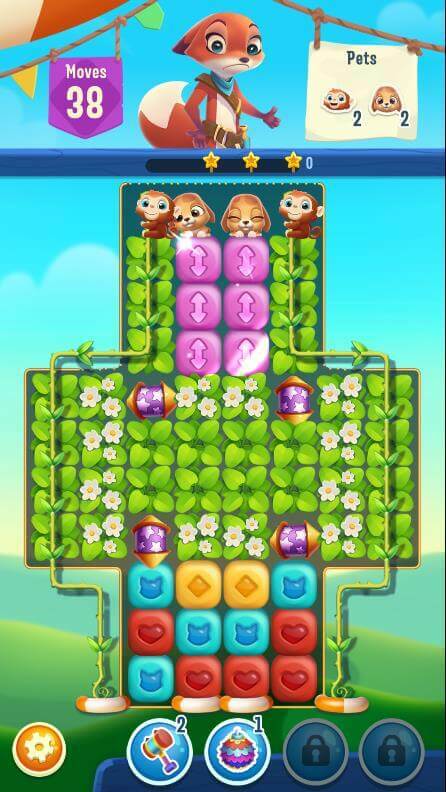 Pet Rescue Puzzle Saga is the newest match 3 puzzle game from King. The game not only challenges your matching skills but also allows you to manage a “pet home” where you can keep all rescued pets and address their demands. As you keep finishing levels, you will be rescuing puppies, chicks, chimps and many other animals. These creatures will then be kept in a pet home, where you can feed them, bathe them and dress them up. You will need coins to fulfill their wishes and make them happy. In return, they will provide bonus lives and other gifts. The game also offers a unique fishing mini-game, where you will have to select a pet to begin fishing and come back after several hours to get a gift from her. Pet Rescue Puzzle Saga’s simplified match 3 gameplay certainly makes it more addictive than other mobile puzzle games. All you have to do is tap two or more blocks of the same color to remove them from the game board. However, rescue objectives are pretty challenging, which is why power ups play a very big role in this game. This guide explains the best ways to use power-ups to complete levels, coins and stars. 1. Removing blocks of a Certain Color: You will have to clear an X number of colored blocks to complete a level. 2. Removing Plants, Shrubs and Ice Blocks: Clear shrubs, ice and plants by matching blocks next to them. You can also use power-ups to clear lots of obstacles at a time. 3. Hatching Eggs: Match 2 or more blocks of the same color beside a half-hatched egg to hatch it so that the chicks can fly to safety. As you progress, you will discover completely unhatched eggs. You will have to match blocks next to them twice to hatch them. 4. Bringing Pets to Lifesavers: You will have to match blocks below hapless puppies and other animals to bring them closer to lifesavers. In most levels, you will have to bring them down to the lifesavers. However, in some levels you will have bring them up to the lifesavers by matching blocks from bottom to top. 5. Clearing Paths for Chimps and other Pets: Match blocks next to obstacles to remove them so that they could use a set path to reach lifesavers. To help chimps reach lifesavers safely, you will have to clear shrubs that grow on vines. Match blocks next to them to clear them. You can also use power-ups to clear more than one shrub. In chimp levels, either you will have to clear shrubs to help them descend and reach the lifesaver or help them climb up using the vines to reach a lifesaver. 6. Making the Cute Little Bear Clear Obstacles for You: In levels that have the big adorable bear, you will have to tap power-ups to tickle him to clear obstacles. Power ups should be placed next to him to tickle the bear. The bear won’t move if you match blocks next to him. When he feels ticklish, he will remove obstacles in front of him, clearing the path for him and other pets. As you progress through levels and different environments, you will discover more pets and various new obstacles. Keep playing Pet Rescue Puzzle Saga to set more animals free. If you don’t know how to play a level, just use the comment form below to ask a question and please do mention the level number. Rocket: To create a rocket, six blocks of the same color must be placed next to each other in any formation. You will notice that the symbols of these six blocks change to arrows, indicating that the rocket power-up is ready for creation. Just tap one of the six blocks to create a rocket. Now tap the rocket to set if off. A horizontal rocket will remove all blocks in a row and a vertical rocket will remove all blocks in a column. Bomb: Tap on 9 blocks of the same color to create a bomb. All 9 blocks should be adjacent to each other. Symbols will change to bombs, suggesting that the bomb power-up is ready to be created. Tap the bomb to destroy blocks around it. Flower Power: You will have to match 14 blocks of the same color to create a flower. This powerup is similar to the rainbow power. Check the symbol of the flower powerup and its color and then tap it. All blocks of that color and symbol will be removed from the game board. So, if the color is purple and the symbol is a piece of bone, then tapping this flower will remove all purple blocks from the game board. In Pet Rescue Puzzle Saga, you can combine power ups to clear lots and lots of blocks on the game board. If you combine two rockets, you create another rocket that triggers a cross-shaped blast clearing blocks in a row and column simultaneously. Combine a bomb with a rocket and create three more rockets that can remove blocks in a row or column depending on the rocket’s orientation (vertical/horizontal). Combine two bombs placed side-by-side to trigger a bigger explosion that will destroy more blocks than a single bomb could ever do. Try combining the flower power-up with a bomb or a rocket and see the magic! A single block’s position is very crucial if you are looking to have two power-ups next to each other to combine them. Remember that a power up appears on the last block you tap. When there is an opportunity to create two different power ups, you should first see if they can be placed side-by-side to create a more “powerful” power up. This gameplay video below illustrates this strategy perfectly. When six or more blocks are placed next to each other, you will see their pattern change to arrows. Before tapping on a block with an arrow mark, check the arrow pattern on each block. Horizontal arrows suggest that a horizontal rocket will be created. Vertical arrows indicate a vertical rocket will be created when you tap a block. You don’t have to tap arrow blocks every time you see them, unless there’s an urgent need to clear blocks or obstacles that will help complete a level faster. Wait out until you see a big combo opportunity. Examine the game board to see if there’s an opportunity to create another power up, which will appear next to the current one. Be patient and always look for creating power up combos. This will help you complete levels before you run out of moves. We hope these Pet Rescue Puzzle Saga tips and hints will help you get more coins and stars. Pay attention to certain levels that will let you earn bonus coins. You will have to complete them to get x2 bonus coins before time runs out.